WASHINGTON -- The U.S. government appears not to have picked up on extremist messages exchanged during the online courtship two years ago between the American-born man accused in the California shootings and his then-fiance in Pakistan, according to lawmakers detailing closed-door briefings by federal officials on Capitol Hill. 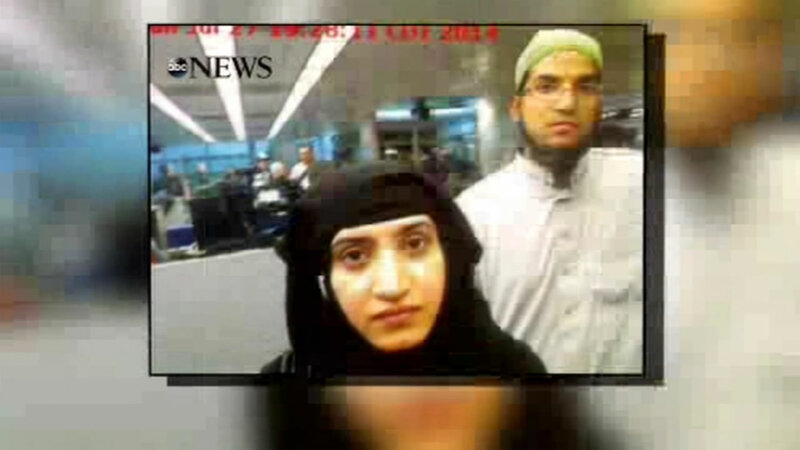 American officials say Syed Rizwan Farook, 28, and his wife, Tashfeen Malik, 29, discussed martyrdom and jihad online as early as 2013. But the couple never surfaced on law enforcement's radar and Malik was able to enter the U.S. on a fiance visa last year despite having professed radical views online. Meanwhile, the investigation into the shootings that left 14 dead last week continued in San Bernardino, where an FBI dive team searched a small, urban lake about 3 miles north of the shooting site. Authorities said the shooters, who killed 14 people at a holiday gathering on Dec. 2, had been in the area. The couple died in a shootout with law enforcement hours after the attack and left behind a 6-month-old daughter. FBI Director James Comey and other senior American officials briefed members of Congress Thursday. Lawmakers repeatedly questioned officials on whether any red flags may have been missed in the last two years. One official said information that the FBI has been able to glean came from an examination of the pair's electronic devices after the attack, rather than intercepts. "Everyone's asking the same questions about how it is that law enforcement didn't know, or intelligence officials didn't know - that they could have flown under the radar and nothing gave an indication that they were a threat," said Rep. Jim Langevin, a Rhode island Democrat and member of the House Homeland Security Committee. Rep. Adam Schiff, the top Democrat on the House Intelligence Committee, said Malik was subjected to an in-person interview during the application process for a visa. He noted that while there were some indications that might have alerted law enforcement to Farook, he declined to detail what those might have been. "I don't think we know yet enough to say these were apparent without the advantage of hindsight," Schiff said. Republican Rep. Will Hurd of Texas, a member of the House Homeland Security Committee, said there's currently no evidence Malik's radicalization would have been readily apparent when she was evaluated for a fiance visa. "I don't think there was missed information," he said. "It appears that there was not any evidence that would have been discoverable during an interview for a visa." He declined to discuss what specifically led investigators to conclude that the couple had radicalized independently as early as 2013, but suggested the information did not come from intercepts. Comey has said Farook had been in communication with individuals who were being scrutinized by the FBI in terrorism investigations, but that the contact he had was not enough to bring him onto the law enforcement radar. "It's safe to say that the information about what happened prior to their marriage and to the attacks in San Bernardino was acquired through forensic investigations of these individual lives," Hurd said, adding: "These people weren't on the radar." Multiple lawmakers raised the fact that neighbors saw suspicious activities but failed to mention them to investigators until after the attack. "There were people who were aware of things, thought they were suspicious, but did not want to be accused of being discriminatory for reporting something," said Rep. Bob Goodlatte, R-Va., chairman of the House Judiciary Committee. He said these people saw activity around the garage that they thought was suspicious. Asked repeatedly whether any hints could have led law enforcement to prevent the attack, Sen. Richard Burr, R-N.C. replied, "Explain to me how you do that without any bread crumbs that are obvious, without somebody that's inside a mosque, that's inside a person's family that tips you off. In this particular case there was nothing like that that gave them a reason to look at this couple sooner than after the attack." More than three years ago, Farook's longtime friend and relative-through-marriage Enrique Marquez bought the assault rifles used in the shooting. Marquez, who checked himself into a mental hospital after the attack, told investigators that he and Farook were plotting an attack in 2012. Idaho Sen. Jim Risch, a Republican who sits on the Senate Select Committee on Intelligence, said they had an actual plan, including buying weapons, but became apprehensive and shelved it because of law enforcement activity and arrests in the area. Marquez hasn't been charged with a crime. Lawmakers said the FBI wouldn't provide details about his ties to the case, citing an "ongoing criminal investigation." Marquez's mother Armida Chacon told reporters Thursday that her 24-year-old son is a good person. Associated Press writers Brian Melley, Michael R. Blood and Amanda Lee Myers in Los Angeles, Alicia A. Caldwell in Washington, Asif Shahzad in Islamabad and Brian Skoloff in San Bernardino contributed to this report.